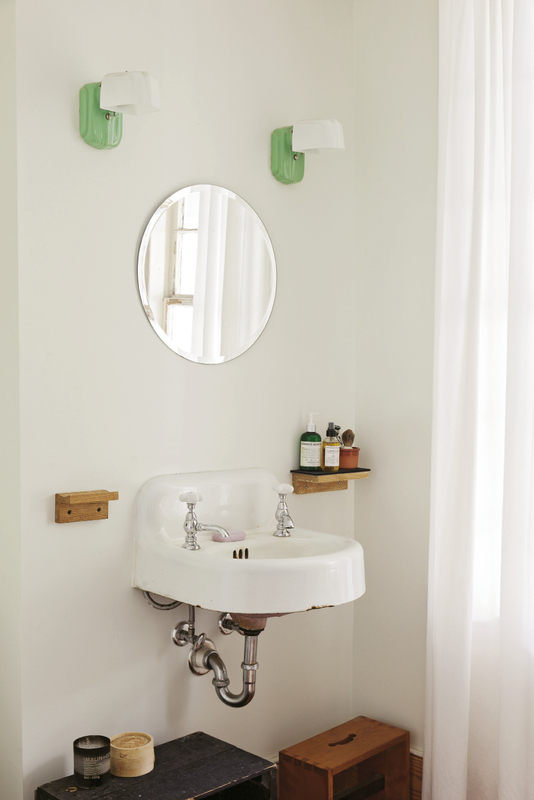 retro-inspired sconces suit the original sink. 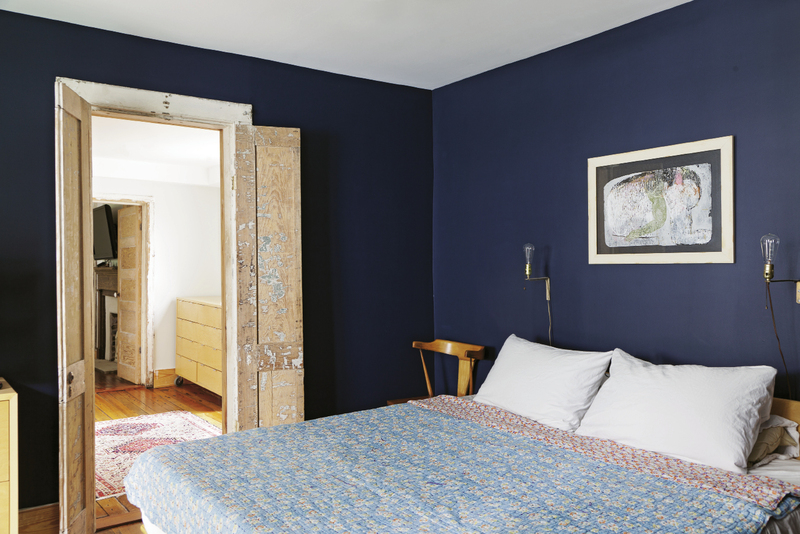 The couple’s bedroom was painted navy to facilitate a good night’s sleep. but vestiges of the sunny paint color remain. Spot Helen Rice and Josh Nissenboim cruising through Elliotborough on their bikes, and you might imagine them pedaling home to a super-contemporary residence or a Brooklyn-style loft apartment. After all, between her gamine looks and pixie hair and his nerd-chic specs, the two cultivate a hip, cutting-edge kind of vibe. 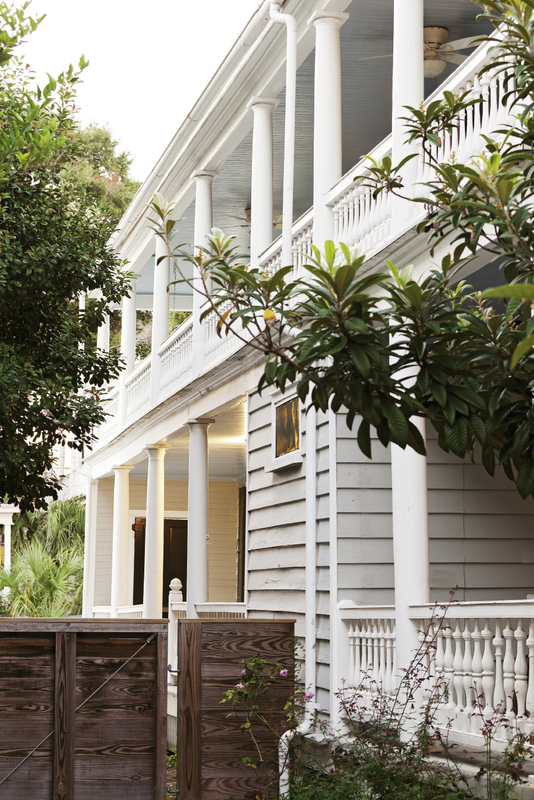 But the abode they share with their two cats, Goosey and Snapper, is actually a very classic mid-19th century Charleston dwelling—at least from the street. 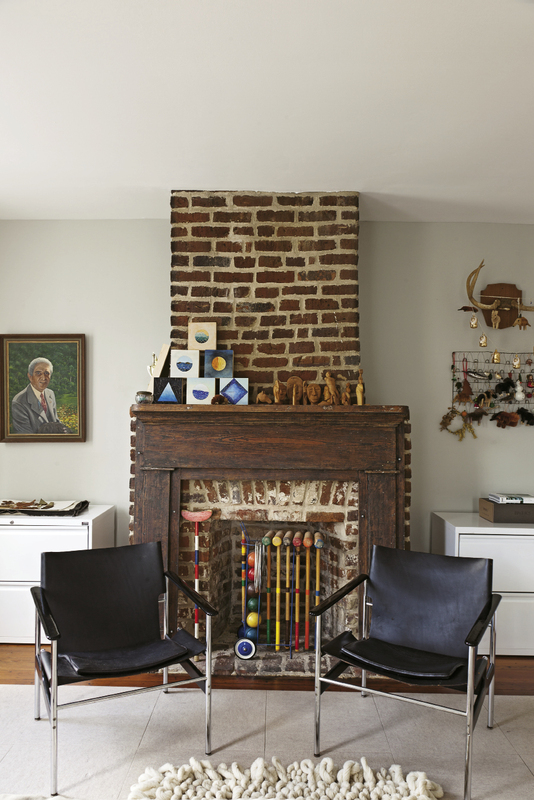 Inside the circa-1845 Spring Street single house, their minimalist style and knack for mixing pieces from different eras make the historic place feel decidedly of-the-moment. On a recent fall afternoon, the lady of the house walked through its rooms, pointing out that the refurbished heart-pine doors, floors, and fireboxes are all original to the home. Yet other elements, such as the renovated kitchen and bold yellow overhang out back, are clearly modern additions. And when it comes to decor, Rice freely dips into different time periods. “Mixtures of high and low or modern and traditional are what interest me,” she notes. In the end, each piece’s provenance hardly matters; it’s more about the art of the mix. And these whiz kids (they’re both 33) have a knack for making things look good: since they founded Fuzzco, a local creative agency, back in 2005, they’ve dreamed up the visuals—logos, menus, websites, merchandise, you name it—that lend personality to dozens of businesses. Westbrook Brewing’s graphic beer cans; logos, signage, menus, and more for restaurants like The Ordinary and Bay Street Biergarten; and Spoleto’s website are just a few of their notable projects. But their dwelling hasn’t always been so polished. When they purchased it in 2008, it had been abandoned for more than a year and needed considerable updating. The now-gorgeous original floors were hidden by layers of plywood, laminate, and carpet; the walls were covered with dated wood veneer; and much of the HVAC, electrical, and plumbing systems had to be replaced. As if all that weren’t off-putting enough, the previous owner had left her personal belongings strewn throughout the home, collecting dust. “It was eerie,” Rice says of the first time she walked through the place. “There were boxes of family photographs, tons of furniture, stuff in boxes.” But beyond the debris, the duo saw loads of potential. 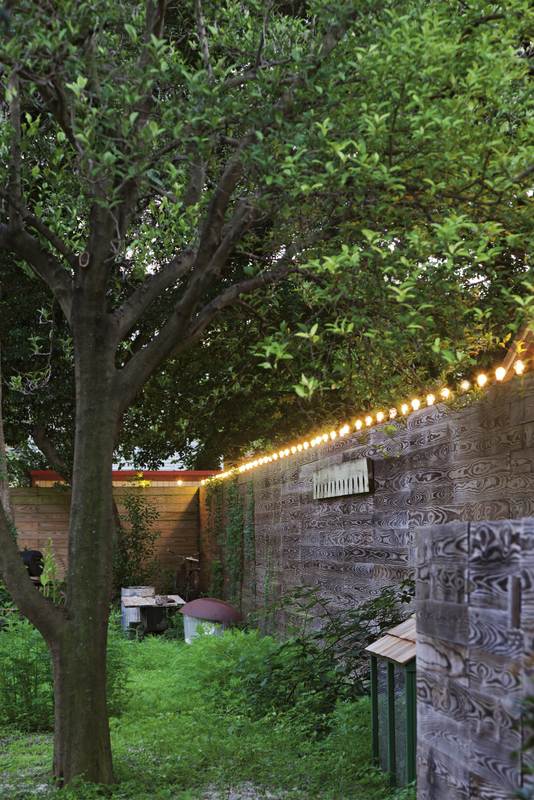 They were sold on the expansive 2,400-square-foot floor plan—they needed every bit of that as they originally used the structure as a live/work space (they’ve since moved the Fuzzco office to Cannon Street)—roomy yard, and all the personality that comes with a home that’s more than 150 years old. “We wanted to make it our own, but we also wanted to start with a place that had a lot of original character,” Rice explains. The structure offered that in spades—and the price was right, too. “We didn’t want to spend a lot. 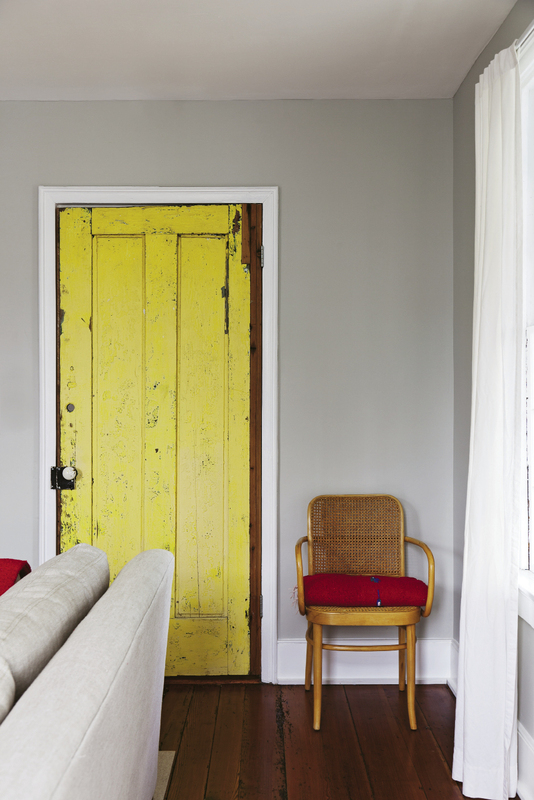 We knew we’d need to renovate and had to budget for that.” So they took the plunge, rolled up their sleeves, and prepared to dive in—with a little assistance from creative friends. To accomplish this, they knocked down two walls, transforming three small choppy rooms into one open kitchen, dining, and living zone. 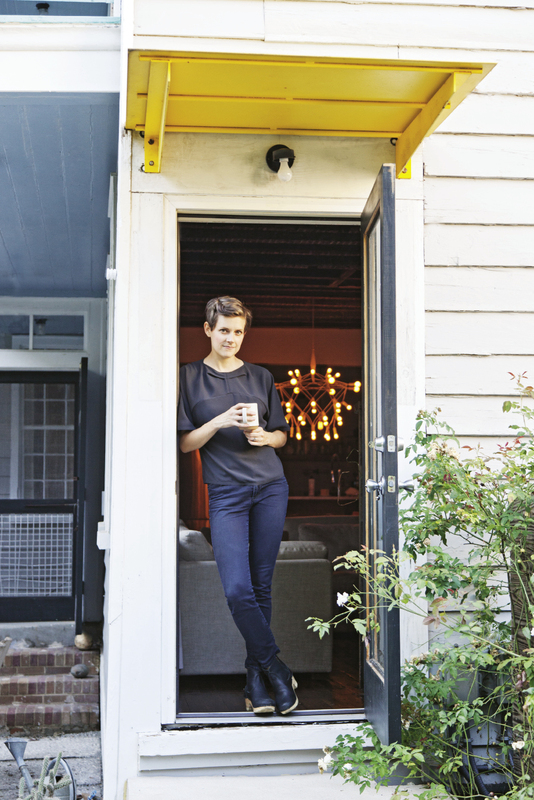 Tucker’s tastes lean toward the contemporary—he designed the first two single-family homes at Mixson, for example—and he advised that new elements, such as the sleek kitchen, not masquerade as historic. “With any additions we were doing, Johnny was excited about making them obvious and not trying to replicate old styles too much,” Rice explains. The couple recruited more pals to help with finishing touches: woodworker Michael Moran custom-built open pine shelves to house dishes, serve ware, and glass jars of ingredients in the kitchen (“we didn’t want to collect a bunch of stuff, and this forces us to be tidy,” Rice says); and area metalworker Peyton Avrett designed a ladder that leads from the living room to the second-floor study. “We’ve always loved ladders and thought it’d be fun to have one,” Rice explains. “Plus it was a way to move between floors without having to go through rooms that were Fuzzco offices at the time.” Avrett also fabricated the mod metal portico, designed by Tucker, that protects the home’s rear entrance. “It’s the only thing on the outside of the house that’s not original, so we made it obviously completely foreign,” says Tucker. 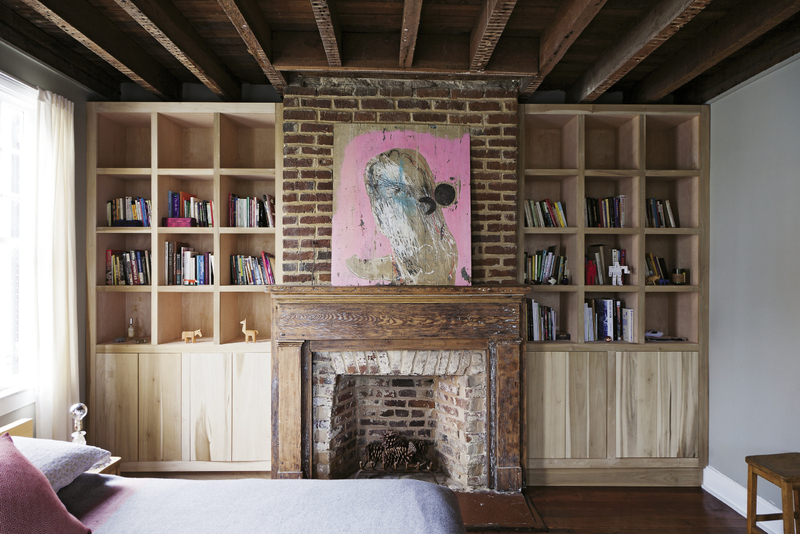 Aside from these few quirky modern touches, the focus throughout was on restoration rather than renovation. 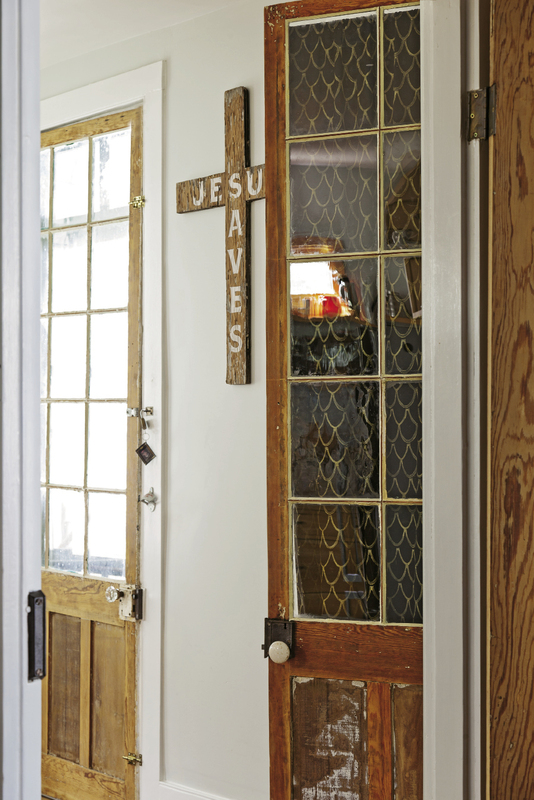 “We tried to keep as many vestiges of the old house as possible,” Tucker notes. For example, they opted not to cover the east-facing dining room wall with drywall. Instead, they purposefully showcase the peeling layers of paint that have been added over the years. They also set out to salvage the original plaster walls and ceilings, but found them too badly rotted everywhere except the foyer. After pulling the plaster down from the ceilings, they decided to leave the handsome rafters exposed. 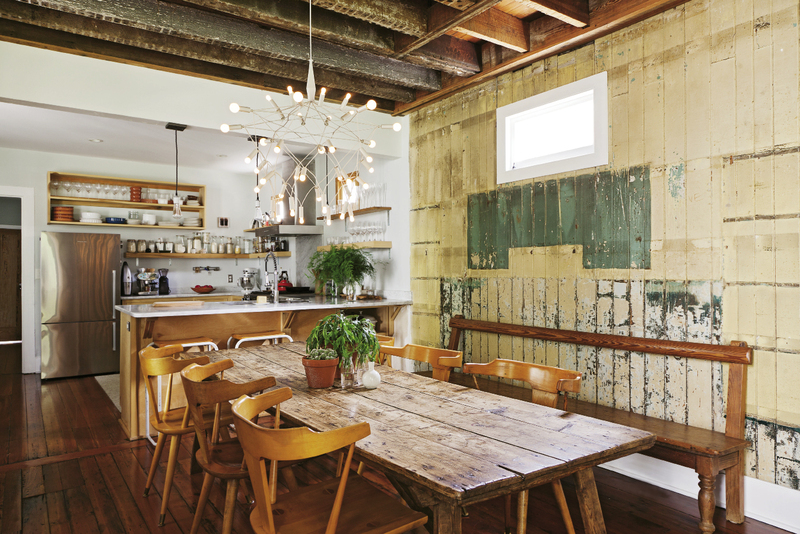 “It probably makes preservationists’ skin crawl to see the exposed floor joists and beams, but we love it because you can see the original hand-hewn wood,” Tucker says. With the architecture and infrastructure in place, the homeowners layered in furnishings, keeping the aesthetic minimal and the color palette natural. “Our style is spare,” Rice says. 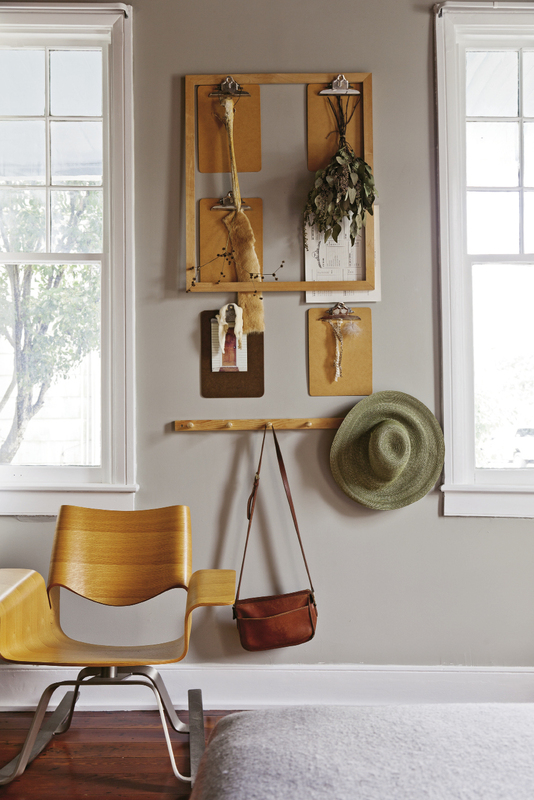 “I like spaces to feel a little empty.” This means each room has only a few, carefully selected furnishings. In the dining room, for example, a big farmhouse table, Windsor chairs by Paul McCobb, and a super-modern chandelier by Patrick Townsend are among the sole elements. 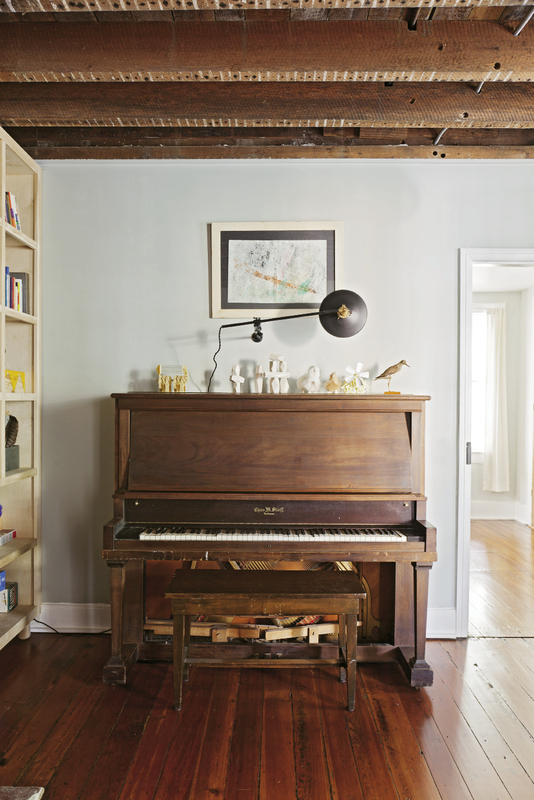 In the first-floor parlor, a piano scored on Craigslist for $10 keeps company with a mid-century modern credenza and a Victorian-style armchair; otherwise, the room is open. 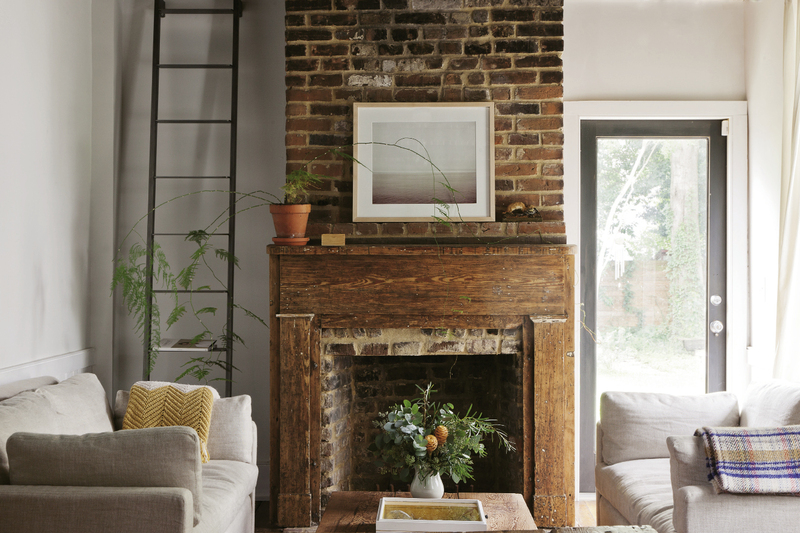 This austere approach allows the bones of the house—such as the exposed brick columns that surround those original fireboxes, the heart-pine floors, and the exposed beams in the ceiling—to command visual attention.